A group of volunteers with the debris they collected by kayak and canoe at the 2018 Sweep Cleanup at Annsville Creek in Peekskill. The 8th Annual Riverkeeper Sweep will be returning this spring on Saturday, May 4, 2019. We’re excited to continue growing our annual day of service with new partners and volunteers in communities across NYC and the Hudson Valley. This page is for Sweep leaders who are organizing cleanups. If you are a volunteer interested in participating on Saturday, May 4, please visit our Riverkeeper Sweep page for details about volunteering on Sweep day or to learn about sponsorship opportunities. Below, leaders can find information that will help you organize a successful volunteer cleanup. For additional help, contact Jen and Nick at sweep@riverkeeper.org or 914-478-4501 x234. Join us for the 2019 Sweep Leader Webinars! These webinars are strongly recommended for first-year Sweep Leaders and may be a helpful refresher for past Sweep Leaders coordinating again this year. Webinars will be held on March 19, 2019, and April 16th, 2019. 2019 Sweep Leader Site Form, Due Sunday, March 4. Still interested in organizing a cleanup but missed the deadline? E-mail Jen and Nick at sweep@riverkeeper.org. Photos of the 2018 Riverkeeper Sweep (download and use for your own promotions; if you need something you don’t see here, contact us for help). Photos of the 2017 Riverkeeper Sweep (download and use for your own promotions; if you need something you don’t see here, contact us for help). Photos of the 2016 Riverkeeper Sweep (download and use for your own promotions; if you need something you don’t see here, contact us for help). Photos of the 2015 Riverkeeper Sweep (download and use for your own promotions; if you need something you don’t see here, contact us for help). How do I organize a Sweep cleanup? How do I order the free trash bags? Do volunteers have to register? How will I get my T-shirt? What about my volunteers? How can I get more people to register for my project? Too many people are registering for my site. What can I do? What should I do to prepare for Saturday, May 5? How do we recycle the trash we clean up? Is the Riverkeeper Sweep rain or shine? My cleanup involves kayaking, canoeing or other activity in the water. Are there guidelines for this? On the day of the event, what is expected of me as a Sweep Leader? How will raffle prizes be chosen and distributed? Call or e-mail Jen Benson (914-478-4501 ext. 234 or jbenson@riverkeeper.org) and we’ll help you get started, and give you the tools you need to organize a successful cleanup. The Riverkeeper Sweep is part of the National River Cleanup, so you can access free bags and other helpful items by registering your site with American Rivers. Register early to ensure timely delivery. Registration for volunteers will open on April 1, so check back for more information then. Registration is an important component of the Sweep because only registered volunteers are eligible for any raffle prizes or coupons for free beverages at participating breweries. Registration also includes a liability waiver. It also makes it easier on you as a leader, allowing you to predict the number of volunteers to expect and reduce paperwork on the day of the event. Please ask volunteers to register in advance. Riverkeeper is partnering with breweries to host meetups following the Sweep, where participants will be treated to one free beverage on the house (non-alcoholic options available). A huge thank you to our 2018 brewery partners: Albany Pump Station (CH Evans Brewing Co.), Angry Orchard Brewing (Walden), Arrowood Farms (Accord), Captain Lawrence Brewing Company (Elmsford), Crossroads Brewing Company (Athens and Catskill), Defiant Brewing Co, (Pearl River), Greenpoint Beer and Ale (Brooklyn), Gun Hill Brewing Co. (Bronx), Industrial Arts Brewing Company (Garnerville), Keegan Ales (Kingston), Kings County Brewers Collective (Brooklyn), Mill House Brewing Company, (Poughkeepsie), Newburgh Brewing Company, North River Hops and Brewing (Wappingers Falls), Peekskill Brewery, Plan Bee Farm Brewery (Poughkeepsie), P&G Restaurant (New Paltz), Single Cut Beersmiths (Astoria), Suarez Family Brewing (Beacon), Tapped (Middletown), Transmitter Brewing (Long Island City), Yard Owl Brewing Company (New Paltz), Yonkers Brewing Company, 2 Way Brewing (Beacon), and 6 Degrees of Separation (Ossining). Check back soon for a list of our 2019 partners. We haven’t yet ordered T-shirts for 2019, but we expect to send all leaders T-shirts. Quantities of T-shirts will also be available for volunteers and can be purchased online during registration. First, don’t get discouraged if not very many people have signed up. Last year, we saw a flood of registrations in the last week before the cleanup. But don’t count on it. 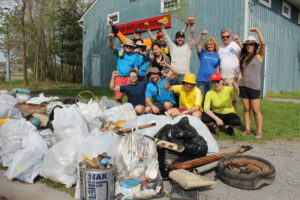 With dozens of service project sites, Riverkeeper is doing as much as possible to promote the event as a whole, through the press, and by reaching out to the roughly 50,000 people in our network, as well as through services like Volunteer Match, UlsterCorps, New York Cares and the Volunteer Center. We will be promoting the event on Metro-North Hudson Line platforms, in partner businesses and elsewhere. Post our Sweep flier in libraries, community centers and other places where people gather and learn about community events. Make sure your cleanup is listed online in community calendars where people learn about upcoming local activities. Invite your friends on Facebook and other social networks. What a good problem to have! If your site can’t accommodate more volunteers, let us know and we can stop registration and direct willing volunteers to other sites that need their help. Just contact us at sweep@riverkeeper.org. What should I do to prepare for Saturday, May 4? Please visit your cleanup site. You should be familiar with the terrain and any potential hazards. You should have a good idea where volunteers should go to pick up the trash, where to collect it and whether you’ll need to post signs, balloons or other guides to help participants find the meeting location. Try to anticipate the questions you’ll get from volunteers, and find the answers. Take photos and share them with Riverkeeper. The best photos showcase the beauty of the shoreline juxtaposed with the ugliness of the trash that we’ll clean up. Use these photos on Facebook and other social networks to help recruit volunteers! Finally, join us on Tuesday, March 19 and Tuesday, April 16 for our Sweep Leader Training Webinars! First, have a conversation with the trash hauler you’ve arranged; make sure you separate recyclables in a way that makes it easy for them to follow through on your good intentions. Second, check out these tips from Zero to Go. Third, register with Terracycle for resources to help recycle hard-to-recycle waste, like cigarette butts and snack bags (please select username “NFPRiverkeeperSweepYourSiteName” (ie.”NFPRiverkeeperSweepRiversidePark”). Yes! We recommend hosting your cleanup, rain or shine—but the decision ultimately lies with you, the leader. You may postpone if necessary—particularly if thunder, lightning or the severity of weather creates dangerous conditions. If you do postpone your cleanup, you should make contact with each of your volunteers, and visit your site to communicate the postponement directly with any volunteers who show up. But please don’t be too quick to postpone. Generally, volunteers are willing to come out for cleanups even if the conditions are a little uncomfortable. The most important thing is the safety of your volunteers. Water temperature and air temperature must total 120 degrees or more to avoid the risk of hypothermia. Weather and river conditions must be calm. Volunteers must have the experience necessary to safely join the on-water cleanup. If any of these conditions can’t be met, volunteers should not be allowed on the water. Arrive earlier than your volunteers. Get your bags ready to distribute, along with any other materials or refreshments you’ve obtained. Check-in registered volunteers, using the EventBrite app or a paper checklist. For any volunteers who have not registered, have them register on paper and sign the liability form. Distribute T-shirts. We will have provided you with the T-shirts and a list of those who ordered T-shirts and their sizes. Distribute coupons for free beverages at our partner breweries to registered volunteers over age 21. Take photos. Last year we got great photos! This year we would love to gather many more photos, including some that of high enough quality to print. Take action shots of people cleaning the shoreline. Get pictures of smiling faces. Take at least one good group shot of your volunteers and the pile of trash they remove from the shore. Take photos of any particularly unusual or noteworthy trash you remove. Share your success in real-time. Use Facebook and other social networks to broadcast the results of your Sweep. Post photos of your volunteers at work, of those unusual items you remove from the shoreline and your group shot. When using Facebook, whenever possible “tag” riverkeeper’s Facebook page by writing @HudsonRiverkeeper. Follow us on Instagram and tag us in your Instagram and Twitter posts using @Riverkeeper and with the hashtags: #RiverkeeperSweep #HudsonSweep or #NYCSweep. Share your results with Riverkeeper. To meet press deadlines, we will need to tally the total number of volunteers and the total number of bags and/or tonnage of trash removed. Please plan to send or call in this information to us at the end of your Sweep. Join your volunteers, and volunteers from other sites in your area, at a local brewery for a meetup to celebrate your success. You deserve it!